© Ralph Pace Image subject to copyright. Permission required to use this image. Storied Seafood: California Swordfish provides an in-depth look into one of the most fascinating and innovative fisheries in the U.S.— the California swordfish fishery. Swordfish is a popular seafood item in the U.S. As with any form of food production, fishing for swordfish has benefits and impacts. On this website you will find information about swordfish as a food source, gear types, bycatch, fisheries management, social and economic impacts, technological and science-based solutions, and other factors associated with the fishery. Collaborative efforts among scientists, fishermen, and regulators to find science-based solutions is key to reducing bycatch. A diverse portfolio of well-designed gear types will help fishermen make a living while responding to a changing environmental, regulatory, and economic landscape. U.S. swordfish is a responsible seafood choice. Bycatch of sharks, turtles, and marine mammals has dropped significantly due to the implementation of a suite of mitigation measures. 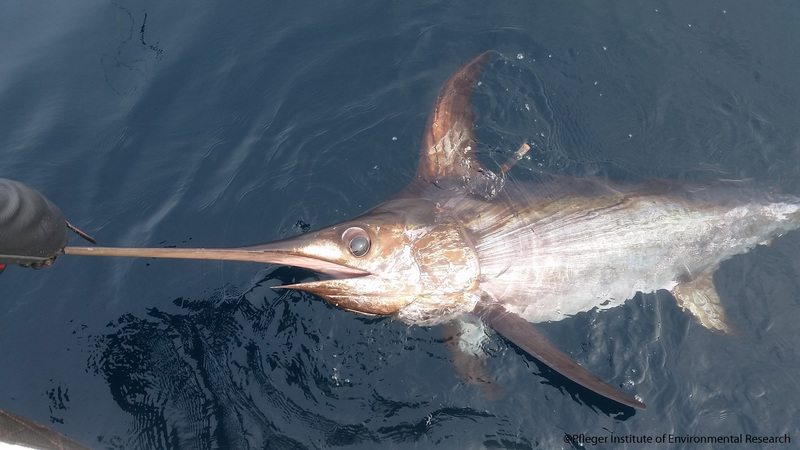 Due to increased effort required by imposing stringent regulations on bycatch the number of U.S. fishermen is dropping, but domestic demand for swordfish remains high. We import 80 percent of our swordfish, much of which comes from sources that don’t have effective environmental standards in place. We must continue collaborative efforts to support science-based bycatch reduction in well-managed U.S. fisheries and export the knowledge and experience from these efforts to improve conditions in foreign fleets. Managing the swordfish fishery is a complex task. Many different stakeholders are involved, including fishermen, government regulators and scientists, environmental organizations, research scientists, chefs, seafood suppliers, seafood consumers and the public. Many different species are involved as bycatch, or the unintentional catch of other species, such as sea turtles, marine mammals and sharks. Many different gear types, or ways of catching swordfish, are also part of the management ecosystem. U.S. fisheries are some of the most highly regulated and best managed fisheries in the world, and the California swordfish fishery is no exception. Leveraging a diverse portfolio of science-based management and technologies, bycatch has been greatly reduced in the California drift gillnet fishery. While we focus here on the local fishery, swordfish imports also come from a variety of foreign fleets and thus this story involves people from around the world. There is a growing body of research suggesting that consuming seafood from U.S. fisheries may reduce the global impacts of bycatch. This is because the demand for products, like swordfish, do not go away just because the local source does. Shutting down a well-managed domestic fishery without an economically viable substitute may do more harm to protected species by increasing the supply from imports that may not adhere to stringent regulations like U.S. fishermen are required to, resulting in greater bycatch globally (called the “transfer effect”). Collaborative efforts to create and implement science-based solutions have played a key role in improving the fishery. In California, fishermen, scientists and regulators continue to work together to find innovative solutions that are environmentally and economically sustainable. Through these collaborations, we have an opportunity to lead the way in finding science-based solutions that can be adopted by some of the exporting countries to reduce these impacts on a global scale. Stay tuned…in the upcoming weeks we will be adding transcripts from our interviews with the experts. A list of experts who contributed is available on our “Meet the Experts” page. NOTE: For the purposes of this project, we will focus on gear used to fish swordfish off the California coast by California vessels (harpoon, large-mesh drift gillnet, and buoy gear). On April 25, 2018, Seafood for the Future convened an expert panel of scientists, conservation organizations, and fishermen to educate the public about the California swordfish fishery. Panelists discussed how scientists, conservationists, and fishermen are working together to find solutions to keep fishermen fishing and reduce bycatch. Storied Seafood was developed by Seafood for the Future and the NOAA Fisheries Southwest Fisheries Science Center to share the stories behind our seafood so that consumers and the public can make informed choices. We highlight the different perspectives from people involved in the fishery and illustrate the collaborative, science-based efforts to find environmental and economic solutions to support a healthy seafood supply for people and the planet.